The 2015 United Nations Sustainable Development Goals (UN SDGs) were adopted by countries to address social, economic, and environmental issues, with each goal having specific targets to be achieved by 2030. These targets provide benchmarks for measurement, and we believe that through partnerships with governments, other companies in the private sector, and civil society, we can have a positive impact on many of the goals. 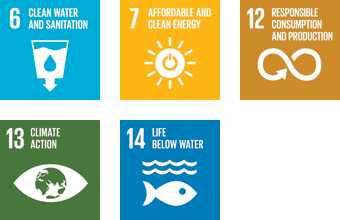 To support 10 of the UN SDGs that Bacardi can impact, we have set five new goals with multiple corresponding targets with an end date of 2025. The new Good Spirited global goals build on past successes and look holistically at our product value chain. When setting these goals, we looked to international standards and benchmarks to ensure our targets were ambitious and meaningful.